The formerly respected SQM Research, in its report called “Labor's Negative Gearing Policy — A Market Viewpoint” (22 June 2016), has joined the conga line claiming that requiring future negative-gearers to invest in new homes would somehow raise rents. Rental changes are initially likely to be negligible with rental growth remaining at current levels of between 1–2%, nationally. However there may be an acceleration from year three (2020) due to the possible cancellation of dwelling projects (ref page ten). So the argument is that rents would rise because supply would fall because projects (meaning construction projects) would be cancelled. But why would a policy directing negative-gearers towards new homes lead to less construction? As it has been well reported... the rental market was mixed during the brief repeal of negative gearing during the 1980s. It should be noted however that there was a 24% decline in dwelling completions over the period thereby reducing the supply of new dwellings. Post September 1987, there was a surge in completions. The risk is that if building approvals (and subsequent completions) fall and stay below underlying demand as a result of a two-three year market downturn, there may be shortage pressures over the medium term, resulting in an acceleration in rents above and beyond the CPI rate. SQM Research believes there is a very high risk that, based on Labor's policy, investors purchasing new property may experience losses on a resale in the first three years of the property's life. The issue is that any secondary buyer will demand some type of discount given that buyer would not be entitled to receive negative gearing tax concessions on the property. And subsequently, such a buyer may demand a discount to offset the lack of concession. In addition is the fact that developers may put an additional premium (over and above what is already there) on such properties given they will be in higher demand than existing properties (due to the concession). But if the initial buyers can't re-sell for a capital gain, what can they do but seek tenants, thereby putting downward pressure on rents? But let's try to be kind. Maybe the claim that construction would fall (pp.2,10) is not based on the experience of 1985–87 (notwithstanding the juxtaposition on p.10). Maybe it's based on the “issue” raised in the second paragraph on p.11, namely that investors in new homes won't be able to re-sell the right to claim negative gearing. Of course, investors in new homes back in 1985–87 had a far worse problem: not only could they not re-sell the right to claim negative gearing; they didn't even have that right themselves. 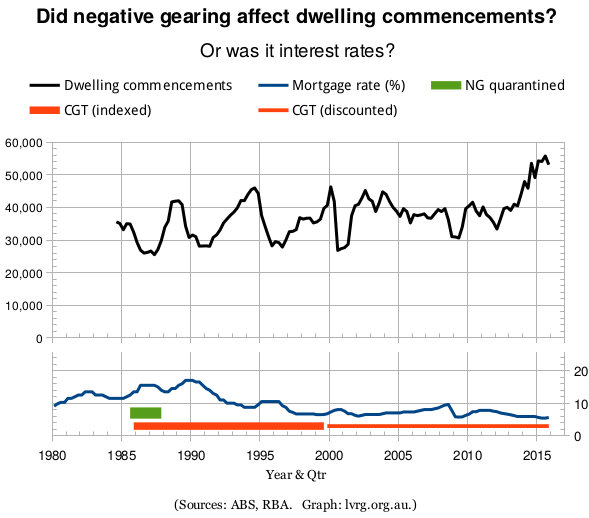 Nevertheless, the above graph offers no evidence that the suspension of negative gearing caused any slump in construction beyond what was caused by other factors. Compared with 1985–87, the current proposal is more favourable to construction in that investors in new homes would still be able to claim negative gearing. Moreover, some of the existing investment in established homes (we don't know how much of it, but certainly some of it, and certainly not a negative fraction!) would be redirected to new homes. Hence I am forced to conclude that the current proposal would increase construction rather than reduce it. But I am also forced to conclude that the inability to resell the negative-gearing right is the reason why SQM claims that construction would fall — because, although it's a lousy explanation, it's the only one they have! SQM expects rising dwelling prices in FY17 in the run up to the 1 July 2017 cross over date as buyers will be active in the secondary (existing) housing market in order to receive the ‘grandfathered’ tax concessions. Excuse me, but those who rush to buy established properties before the policy change won't be able to re-sell the right to claim negative gearing after the change. So we are supposed to believe that, on the one hand, investors will be so spooked by the non-transferability of negative gearing that investment in new homes will fall, in spite of the continued allowance of negative gearing for new homes but not established homes; and on the other hand, investors will be so un-spooked by the non-transferability of negative gearing that they will not only pay an increased premium for new homes relative to established homes, but will scramble to buy negatively-geared established homes while they still can! What if a “new” home is defined as one that has not yet been lived in, even if it has been previously sold? Then off-the-plan buyers will still be able to sell their homes as new, so that the “issue” raised on p.11 will not exist for them. And no definition of “new” can resolve the contradiction between the alleged fall in construction and the alleged scramble to beat the policy change. Wherever you draw the line between new and established homes, the homes that negative-gearers will allegedly rush to buy before the change will be those that already count as established homes, and the new homes that investors allegedly won't want will be those that will count as established on the next sale. As neither category will come with a transferable negative-gearing right, there is no reason to suppose that one will be snapped up while the other will be avoided. That much is uncontroversial, as long as we understand that rental yield is the ratio of rent to price, so that the yield may rise through an upward effect on rent or a downward effect on price, or, for that matter, a downward effect on rent and a bigger downward effect on price — all effects being relative to a continuation of current policy and the associated trajectories of rents and prices! But yes, if negative gearing is restricted for future investors, the effective after-tax interest rate faced by those investors will rise, so that it will take higher yields (ratios) to persuade future investors to invest. As new homes will be exempt from the changes, they will not become subject to the higher effective interest rate until they are re-sold. This will dilute the effect of the policy on yields, so I can't vouch for SQM's numbers; but yes, there will be some effect, and SQM didn't really need to take any pains to prove it. In reality what is more likely to actually happen is an impact in terms of rental income and property prices both adjusting, with a rise in rental income likely to offset some of the dwelling price falls and being stretched over a period of time. Again that does not explain why the increase in the rent/price ratio should be due, even in part, to an increase in the numerator — especially if future investors, in order to claim negative gearing, need to invest in new homes, stimulating construction and exerting downward pressure on rents. On p.6 we find a graph of rental yield, including the 1985–87 quarantining period, which looks exceptional in the graph. But the graph is of yield, not rent, and the page is curiously silent on the distinction between the two. As has been repeatedly explained at MacroBusiness, if you plot the real year-on-year change in rent for the combined capital cities over the last four decades, there is nothing special about the period during which negative gearing was quarantined; real rents rose faster at other times before and after that period. Another curious silence occurs on pp.7–8, where we find much discussion of sales and finance approvals for the 1985–87 period, but no acknowledgment that sales in the housing market can be turnover of existing stock rather than first sales of newly built stock, and no acknowledgment that the latter will be exempt from Labor's proposed changes but were not exempt from 1985 to 1987. In short, the middle pages achieve little but to distract attention from the crucial difference between yields and rents, and the crucial difference between what was done 30 years ago and what is proposed now. SQM is not the first “independent” consultant to claim that directing negative-gearers towards new supply would somehow reduce supply and raise rents. Others include BIS Shrapnel and ACIL Allen. But all of them, in their treatment of the present issue, have flouted the same golden rule: If you want to bamboozle your opponents with dodgy modelling, you have to produce a big fat report that nobody has time to read. If your report is too short — and SQM's is the shortest of the three — your faulty reasoning will be laid bare. * “Dwelling commencements” are private-sector, quarterly, and seasonally adjusted (ABS 8752.0, Table 33). The “mortgage rate” is the “indicator” standard variable mortgage rate (RBA Series ID FILRHLBVS, for the middle month of each quarter). The green and orange bars show periods during which the respective policies were in force, with accuracy limited by the time resolution of the spreadsheet on which the graph is based.